One of the sounds of summer is the recognisable buzzing of busy bees. Bees are a beautiful symbol of British summertime, but much more importantly are one of the best performing pollinators vital for pollinating plants and crops across the world. Of the 270 species of bee to have been recorded within Britain, 27 of these are bumble bee species and there’s only 1 honey bee species. Wild bees pollinate two thirds of British crops whilst cultivated honey bees pollinate the remaining third. The exact economic value of pollinators in the UK is uncertain due to small numbers of studies but is estimated at hundreds of millions of pounds (DEFRA). 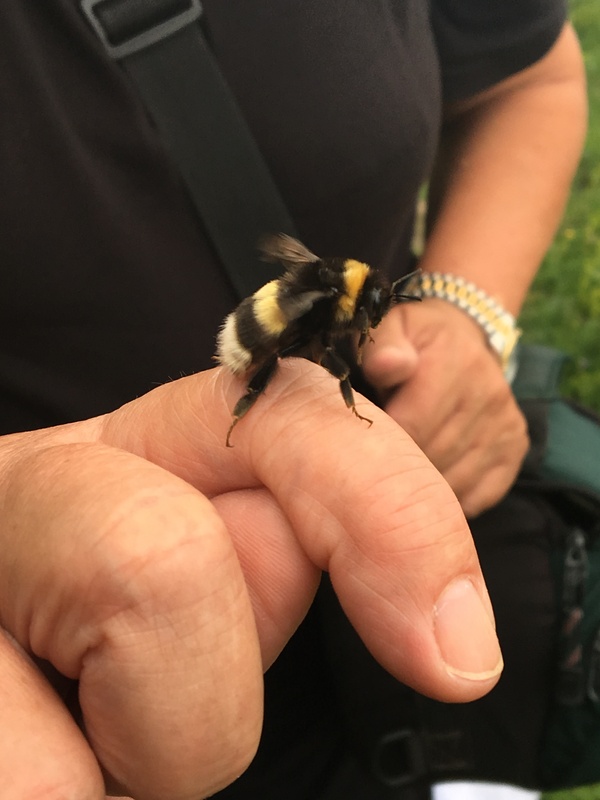 I’ve been wanting to learn more about bees and how to identify different species, I was fortunate enough to travel to the Field Studies Council’s Malham Tarn Residential Centre at the start of June to take part in a Steven Falk Bee Workshop. Steven wrote the ‘Field Guide to the Bees of Great Britain and Ireland’ which we used throughout the workshop, making use of the guide’s dichotomous keys and illustrations and photographs of the different bee species. It was a really interesting course – we focused on the habitats around Malham Tarn and the bees that can be found there. The habitats we visited included nationally important calcareous (limestone) grassland and fen/mire (wet grassland) habitats which are part of the Malham-Arnecliffe Site of Special Scientific Interest. We saw fabulous plants such as Bird’s Eye Primrose, Butterwort, Northern Marsh Orchid and Water Avens which was particularly popular amongst the bees. We identified thirteen different species of bee using these habitats. These included the Tree Bumblebee (Bombus hypnorum), a Red-tailed Bumblebee queen (Bombus lapidarius), the Bilberry Bumblebee (Bombus monticola) and the Moss Carder Bee (Bombus muscorum). To ID accurately we learnt to catch the bee carefully with a net and then place it into a container to get a closer look at the head, thorax and abdomen to look for distinguishing features. After a few minutes the bee is released back where it was found. Declines in bee populations are due to a dangerous combination of reasons which together add up to a growing crisis – reasons include climate changes, creeping urbanisation, agricultural practices including using pesticides, a decline in habitats including the loss of meadows – unfortunately 97% of wildflower meadows in Britain have been lost since 1937. Bees need continuous legume-rich flower habitat to sustain populations. Lots of bee species live in large colonies and need enough flowers in their surrounding habitat to sustain up to 400 worker bees over a season so that a colony can successfully produce new males and queens. Remaining species rich grasslands like meadows have become isolated across the landscape as areas shrink and contract, such habitats need to be better linked by creating corridors and stepping stones for bees to move through and between and so be able to make best use of the nectar (and pollen) producing plants. Like many other species, bees benefit from ecological networks where semi natural habitats are bigger, better and more joined up (Making Room for Nature, 2010, John Lawton). As well as the species rich grassland areas themselves there are other useful linear versions such as species rich road verges, arable farmland flower margins, and native species hedgerows which can all act as useful corridors for pollinators. Domestic gardens with bee friendly plants can act as useful refuelling stops/stepping stone habitats. The Pollinator Monitoring Scheme brings together experts and the public to monitor pollinator populations over time. Anyone can join in with the Flower-Insect Timed Count, which is reassuringly complex. If you want to help build up a national picture of bee populations then The Great British Bee Count continues until the 30 June this year. There is an App to help you to ID and record the different bee species you see. Sightings will help the experts to understand how bees are faring and results feed back into the Pollinator Monitoring Scheme. This entry was posted in Biodiversity, Climate Change, Conservation, Ecology, Environment, National Park, Natural Environment, North York Moors and tagged Animals, Grassland, Invertebrates, Pollinators, Species rich grassland, Species rich roadside verges by North York Moors National Park. Bookmark the permalink.